Among a lot of resorts lining Long Beach, it’s still largely undeveloped, so there’s ample room for exploration and escaping. Dive the reefs, kayak in the bays, eat up the back-road miles on a motorbike, or just simply enjoy the life of a lotus eater by lounging on the beach, indulging in a massage and dining on fresh seafood. The tear-shaped island is located in the Gulf of Thailand, 45km west of Ha Tien and 15km south of the coast of Cambodia. It’s no lightweight: at 48km long (with an area of 574 sq km), Phu Quoc is Vietnam’s largest island (about the same size as Singapore). It’s also politically contentious: Phu Quoc is claimed by Cambodia who call it Koh Tral and this explains why the Vietnamese have built a substantial military base covering much of the northern end of the island. It was only granted to Vietnam by the French in 1949, as part of the formal annexation of the Mekong Delta. Phu Quoc doesn’t have the delta’s ability to produce rice because it’s not a really part of the Mekong Delta . The most valuable crop here is black pepper, but the local people here have traditionally earned their living from the sea. Phu Quoc is also famed across Vietnam for its production of tasty fish sauce (nuoc mam). The island is also known as its hunting dogs, which have ridgebacks, curly tails and blue tongues. Muscular and energetic, they are said to be likely to pick up their master’s scent from over 1km away (the nuoc mam their masters eat probably helps). Unfortunately, the dogs have decimated much of the island’s wildlife. Although it is considered pretty developed (a new international airport, a golf course, new roads and a planned ‘casino eco-tourism resort project’), much of this island is still protected since it becomes a national park in 2001. Phu Quoc National Park covers close to 70% of the island, an area of 314 sq km. Phu Quoc’s rainy season lasts from late May to October, when the sea gets rough and a lot of diving stops. The peak season for tourists is midwinter, when the sky is blue and the sea is calm, but it can be pretty damn hot around April and May. At the time of research, the road leading to Sao Beach in the south of the island was being widened and resurfaced to help improve access. Phu Quoc Island was a base for the French missionary Pigneau de Behaine during the 1760s and 1780s. Prince Nguyen Anh, who later became Emperor Gia Long, was sheltered here by Behaine when he was being hunted by the Tay Son rebels. Phu Quoc, which was a relatively remote and forested island, was useful to the French colonial administration as a prison. The Americans took over where the French left off and housed about 40,000 VC prisoners here. The island’s main penal colony, which is still in use today, was known as the Coconut Tree Prison (Nha Lao Cay Dua) and is near An Thoi town. Even though it’s considered a historic place, plans to open a museum here have stalled. There is a tangle of hotels, restaurants, bars and shops on the island’s main town and chief fishing port on the central west coast. Scenic Long Beach ranges to the south, where most of the beach hotels, resorts and bars cluster. The old bridge in town is a great vantage point to photograph the island’s fishing fleet crammed into the narrow channel. The town itself is not that exciting, though the filthy, bustling market is exciting. On contrary, the attractive night market is scrupulously clean and filled with delicious food stalls. (Dinh Cau; Ð Bach Dang, Duong Dong) Less of a castle, more of a combination temple and lighthouse, Dinh Cau was built in 1937 to honour Thien Hau, the Goddess of the Sea, who provides protection for sailors and fishermen. The ‘castle’ is worth a quick look and gives you a good view of the harbour entrance. Around sunset, locals stroll along the promenade leading from the castle to Ð Tran Hung Dao. (Duong Dong; 8-11am & 1-5pm) The distillery of Nuoc Mam Hung Thanh is the biggest of Phu Quoc’s fish-sauce makers, a short walk from the market in Duong Dong. At first glance, there are many giant wooden vats that can make you think you’ve arrived for a wine tasting, but one sniff of the festering nuoc mam essence jolts you back to reality. Most of the sauce produced is exported to the mainland for domestic consumption, though a remarkable amount finds its way abroad to kitchens in Japan, North America and Europe. There’s no entrance fee to visit, although you’d be best off taking a guide along if you don’t speak Vietnamese . Keep in your mind that although nuoc mam is a wonderful gift for your distant relatives, you may not be able to take it out of the country. For instance, Vietnam Airlines, among other carriers, has banned it from its planes. (Bai Truong;) Long Beach is draped invitingly along the west coast from Duong Dong almost to An Thoi port. Development focuses in the north near Duong Dong, at which the recliners and rattan umbrellas of the various resorts rule; like all beaches in Vietnam, these are the only stretches that are kept clean. With its west-facing aspect, sunsets can be stupendous. No problem for beachcombers to stretch out their towels on the sand, but get moved on quickly if you get too close to the paying guests. Long Beach can be reached easily from Duong Dong on foot, but a motorbike or bicycle is necessary to reach some of the remote stretches flung out to the southern end of the island. There are several little lanes heading from the main Ð Tran Hung Dao drag down to Long Beach that shelter some of the wonderful places to stay and eat. There are a few bamboo huts where you can buy drinks, but bring water if planning a long hike along the beach. Beachside massages are popular here, but you should be clear about what you’re paying for: a neck rub can quickly turn into a foot massage, manicure and leg-hair threading – often all simultaneously. (www.coinguonphuquoc.com; 149 Tran Hung Dao; admission 20,000d; 7am-5pm) With displays on Vietnamese medicines, Stone Age tools, local ceramics and a small room devoted to the island prison, this five-floor privately owned museum is an informative introduction to Phu Quoc history and culture. (Bai Sao;) The delightful curve of beautiful Sao Beach bends out alongside a sea of mineral -water clarity just a few kilometres from An Thoi, the main shipping port at the southern tip of the island with white sand like powdered ivory . There are a couple of beachfront restaurants, where you can settle into a deckchair or partake in water sports. If heading down to Sao Beach by motorbike, fill up with petrol before your journey because there are very few fuel stations on the way back. Jet skis (450,000d for 10 minutes) can be hired on the beach. (Bai Khem;) Khem Beach, which is undeveloped, is one of the most attractive beaches on the island, but is also one of the few remaining areas that’s under military control. Consequently, it’s generally closed to the public. (Bai Vong;) The excellent Vong Beach is where the fast boats from the mainland dock. Many other beaches in the vicinity are strewn with rubbish. (Bai Cua Can;) The most accessible of the northern beaches, Cua Can is about 11km from Duong Dong. It remains mercifully quiet during the week, but can be very busy at weekends. Let’s take an interesting ride through the villages around Cua Can , with the road crossing the river several times on rickety wooden bridges. 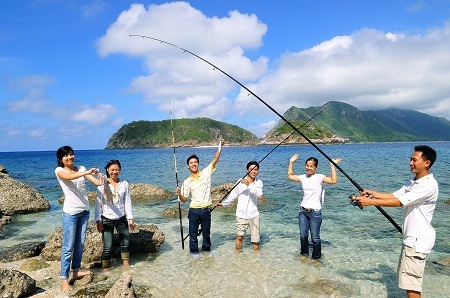 (Bai Ong Lan;) Ong Lang Beach has a series of sandy bays sheltered by rocky headlands. Lots of midrange resorts in this area service those wanting to get away from it all. (Bai Vung Bau, Bai Dai, Bai Thom) Still retaining their isolated, tropical charm, these northern beaches are almost uninhabited , let alone crowded. There is a new road following the coast along Vung Bau (Bai Vung Bau;) and Dai (Bai Dai;) beaches, cutting down on motorbike time and red dust in your face. The road from Dai to Thom (Bai Thom;) via Ganh Dau is attractive , getting through dense forest with tantalising glimpses of the coast below. Nearly 90% of Phu Quoc island is forested and the trees and adjoining marine environment enjoy official protection. In fact , this is the last large stand of jungle in the south, and in 2010 the park was declared a Unesco Biosphere Reserve. The forest is most dense in the northern half of Phu Quoc island. The area is a forest reserve (called Khu Rung Nguyen Sinh in Vietnamese) and get a motorbike or mountain bike to pass it. There are a few primitive dirt roads, but no real hiking trails.